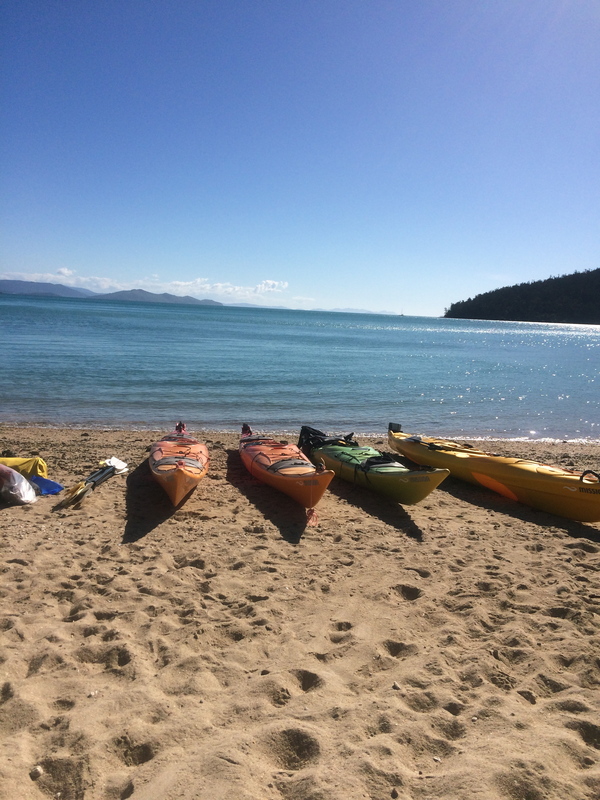 A Paddle in the Whitsundays? 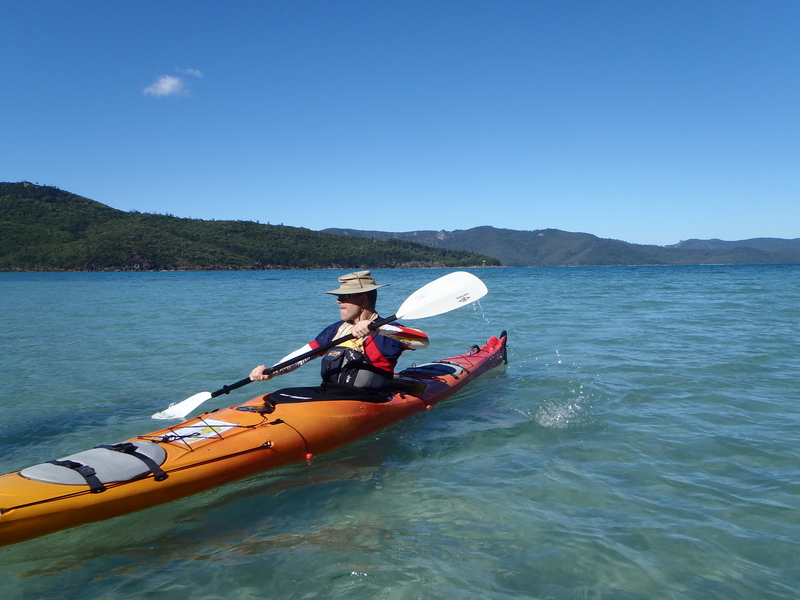 In 2006 I read an article in Wild Magazine about a lady who went to Queensland and hired a kayak from Salty Dog Sea Kayaks and spend an amazing time exploring the islands of the Whitsunday’s. 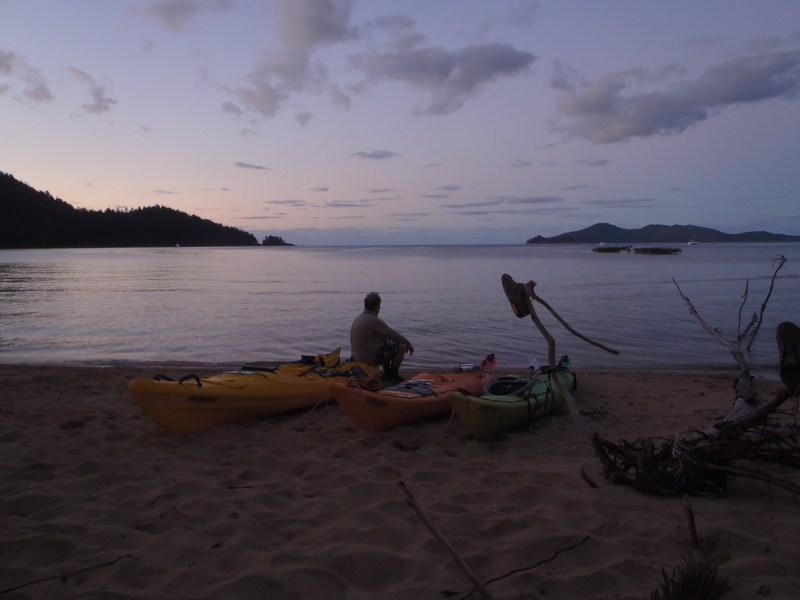 I was hooked, both on the idea of a paddling holiday in the Whitsunday’s and on sea kayaking, something I had never, at that point, done before. I got put on standby! 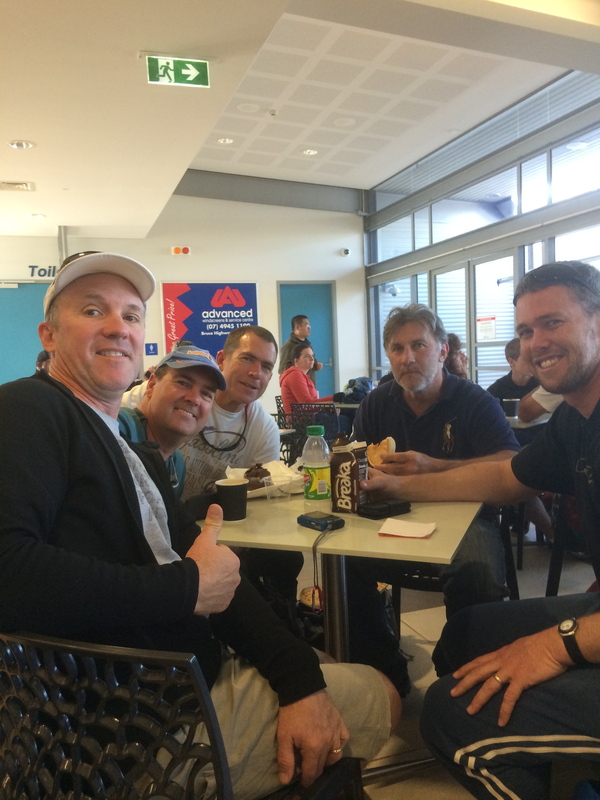 Stuart had his flight on the wrong night and had to pay over $2000 and all his remaining points to get a business class seat and James…well James was relaxed and ready to leave Perth an hour and a half before we even arrived at Perth airport! 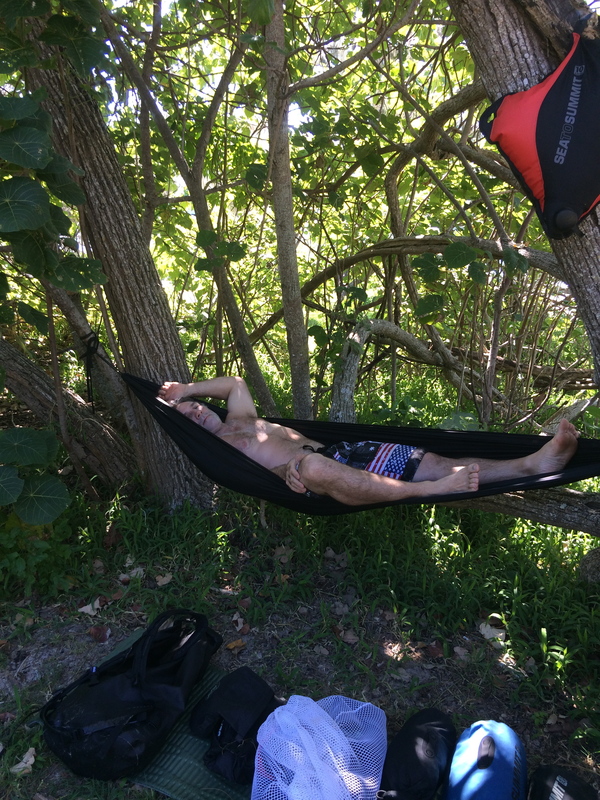 Neale and Lance were already overnighting in Brisbane. 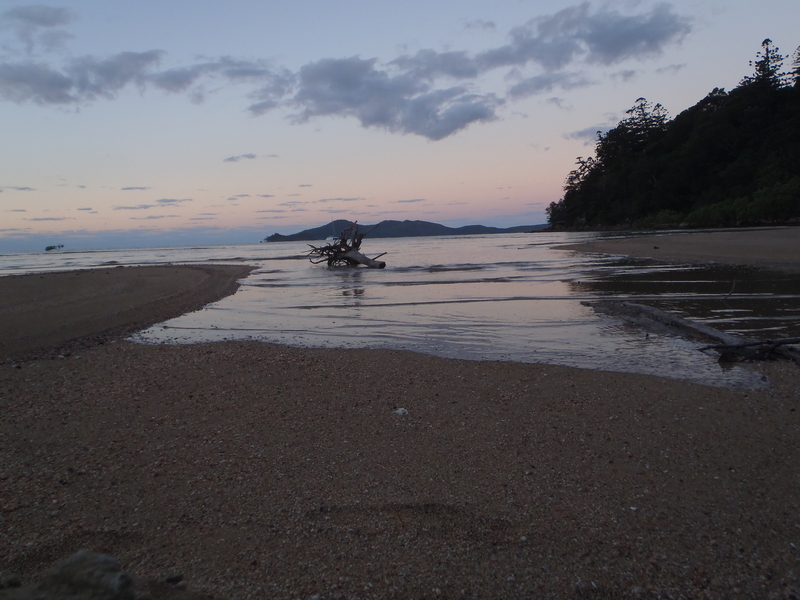 I managed to land a seat at the very last second – we were all on our way to rendezvous in Brisbane before flying to Proserpine and busing to Shute Harbour, to pay for our boats and ferry to Dugong Beach Whitsunday Island. 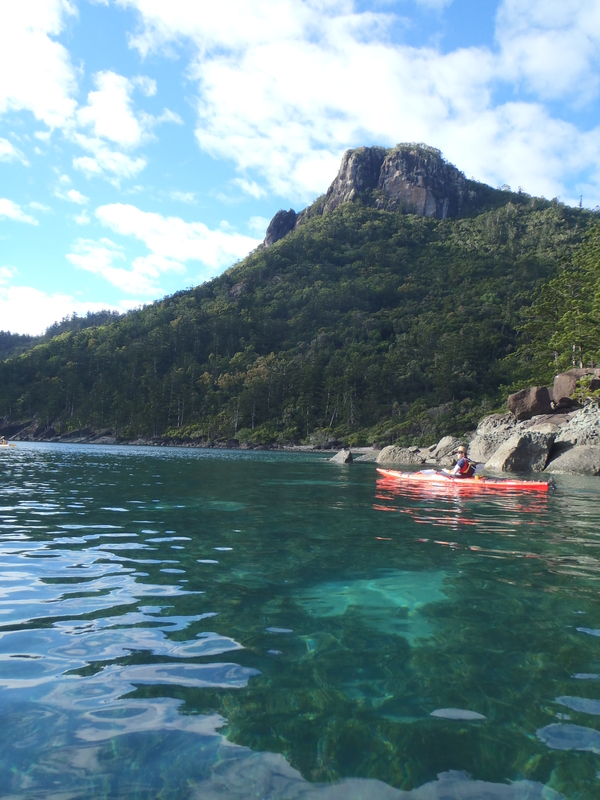 We were speechless as we rounded the hills toward the Shute Harbour, the turquoise water shimmered in the morning sun, hardly a ripple broke the surface. 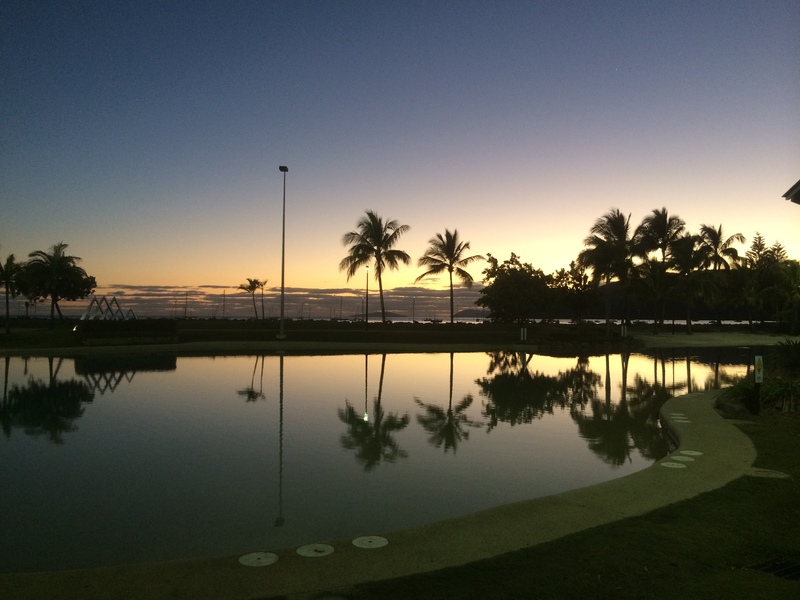 My memories of working here on Daydream Island 22 years ago flooded back. We were talked into leaving on the 1pm water taxi instead of the 2pm to please the company, it was a mad rush and we really didn’t get the briefing we’d hoped for. We would have asked more questions like “Where are the promised sails?” But all in all the boats were in very good condition…apart from a worn rudder rope, and their was hardly enough wind to fill a sail. The taxi was filled with gear to the roof, not ours, but a group of young people who were camping at Dugong Beach for the week, more gear than I’ve ever seen for a week of beach camping! 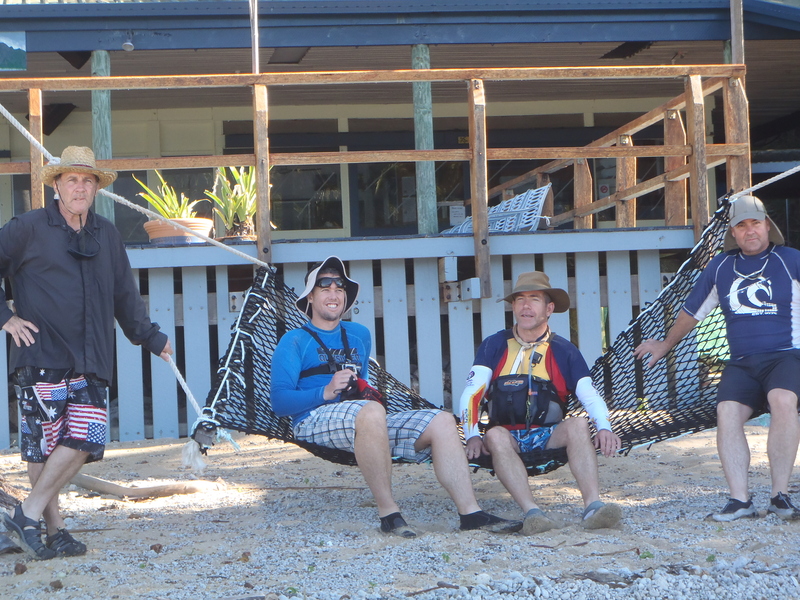 We set up camp but Stuart, James and I had one missing ingredient for a happy week – Food! 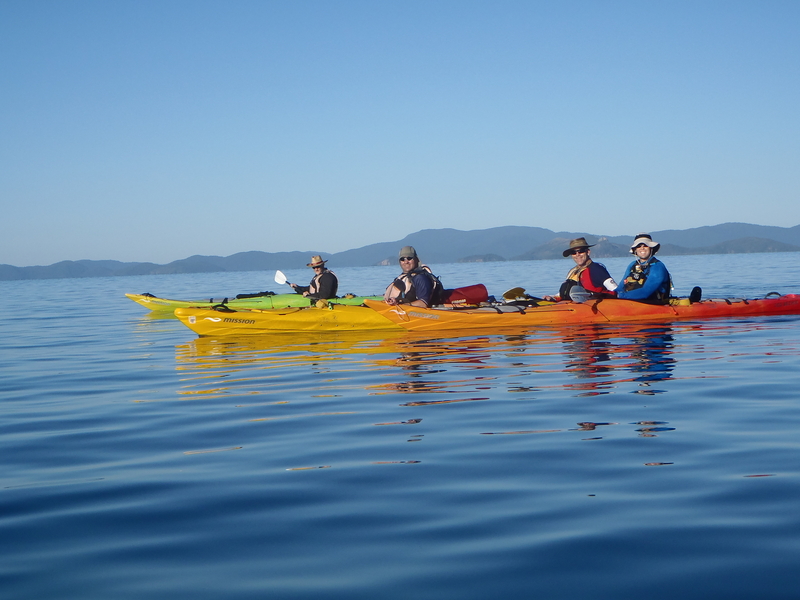 We had a plan, the 5 of us climbed aboard our kayaks for the first time and paddled a couple of kms south to where Stuarts friends had their boat moored, they had carried our food from Perth. The lovely Catamaran was the home of Mike and Chrissy who played host to us for an hour of great chats, banana cake and tea. 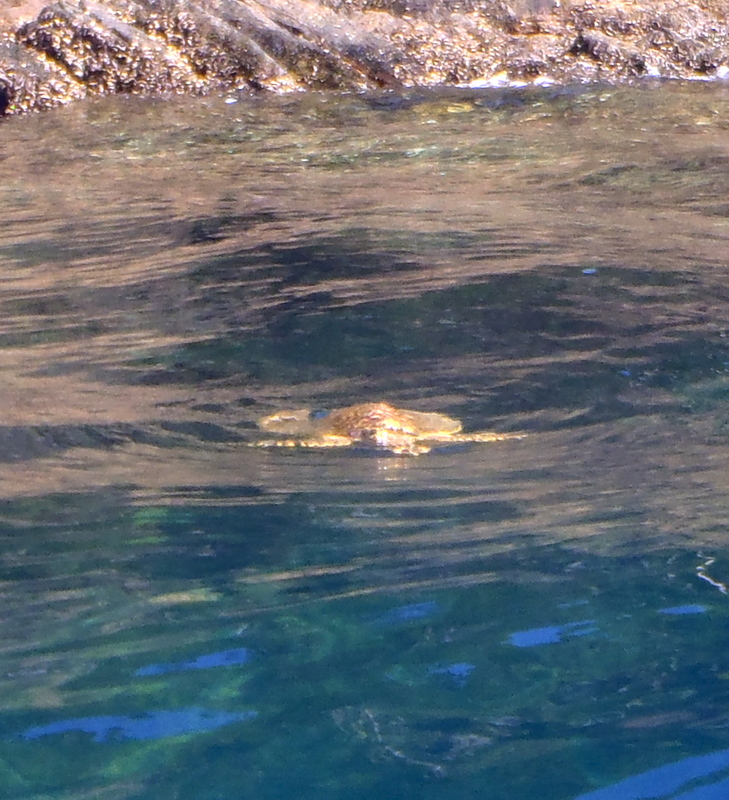 As we returned to camp we encountered our first of many big sea turtles lounging in the bay. The sun set on our first event-filled day. 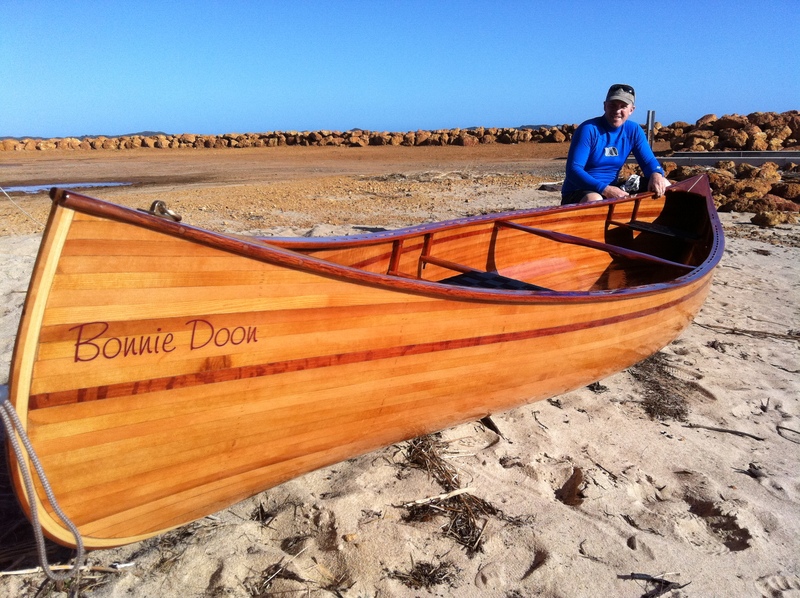 Sunday 6th July – Dugong Bay to Curlew Beach, Hook Is. 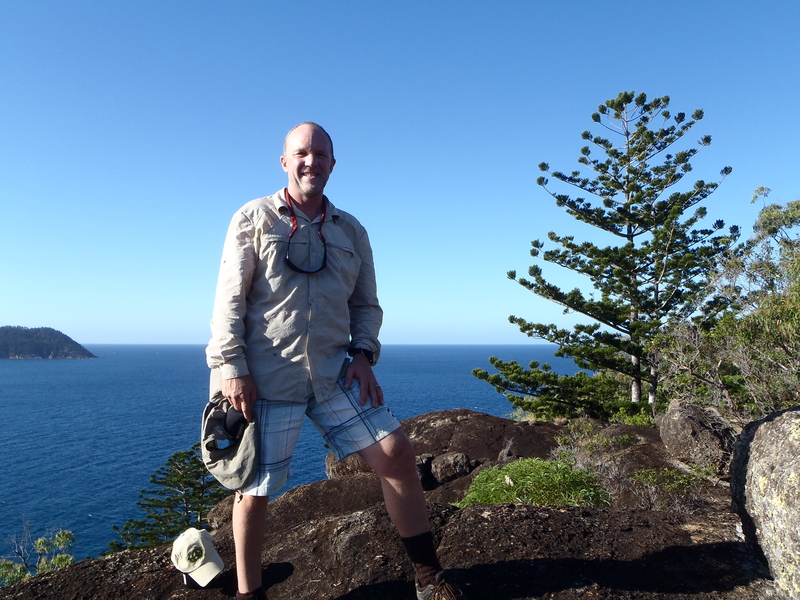 After a perfect nights sleep (other than the scuffle of the native rats) we awoke around 6.30am, breakfasted and headed off on foot to summit Whitsunday Peak which sat above our campsite. 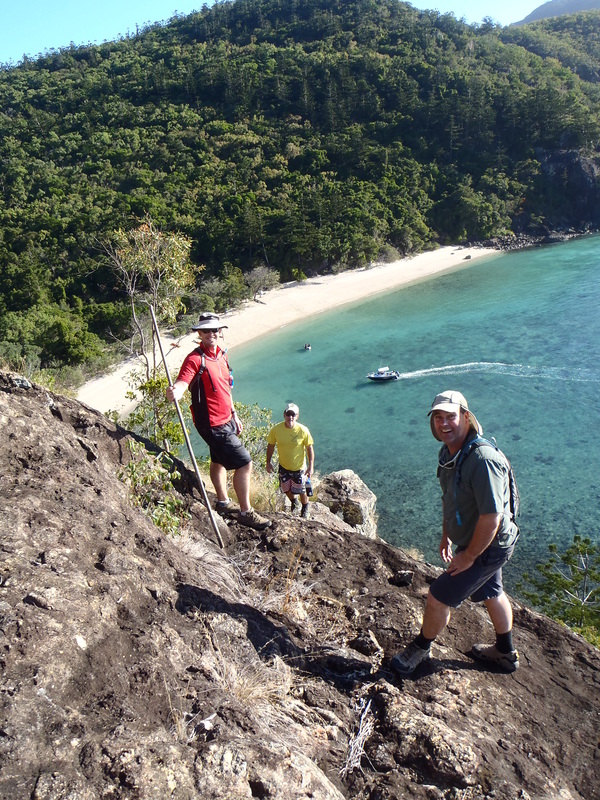 A 3 hour return walk with spectacular 360º views of the Whitsunday group of islands. 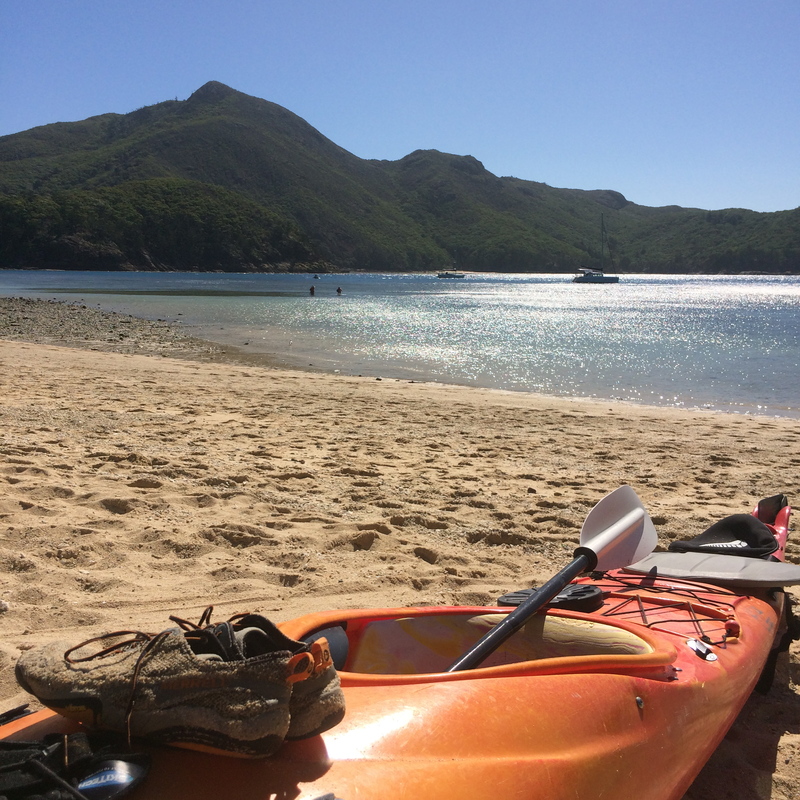 We were back for an early lunch sitting by our kayaks overlooking what was still a glassy flat ocean…or Coral Sea to be precise. 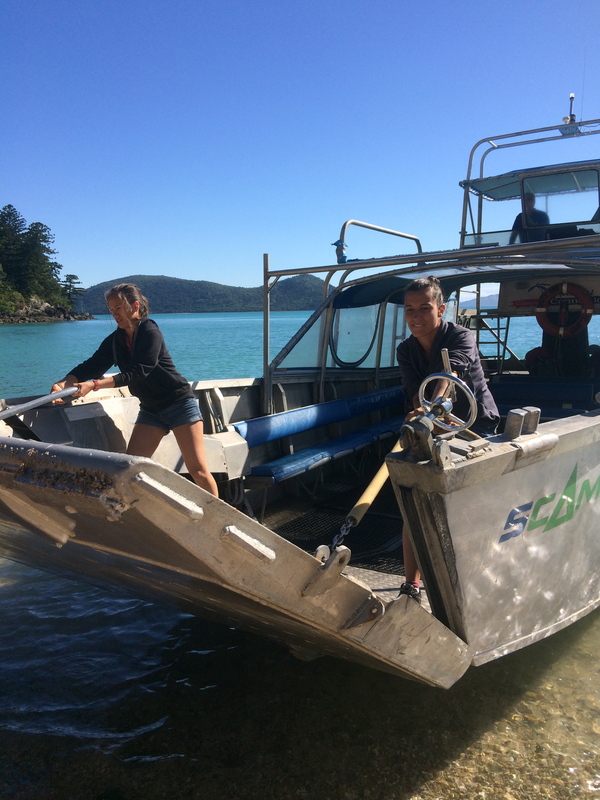 We finally loaded up our boats and headed off to our campsite some 11km to the North West on Hook Island. The paddle was beautiful, picture perfect, and we arrived to an empty peaceful campsite. 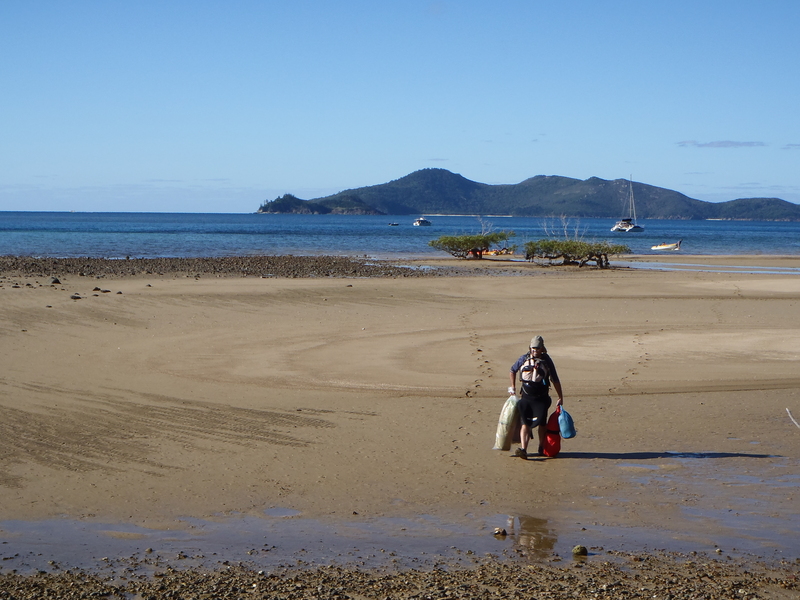 We emptied our heavy loads onto the beach, most of the weight being made up of water, as we had taken on an extra 25L at Dugong in the form of a jerry can which was strapped today to Neale’s deck. Water was a stress at first but needlessly so as it turned out. We thought we may need over 4L per person per day and we only used about 2! This saving was due in part to the fact that we had many pre-hydrated meals that only required boiling in the bag, so the water was then used for tea or rice etc. 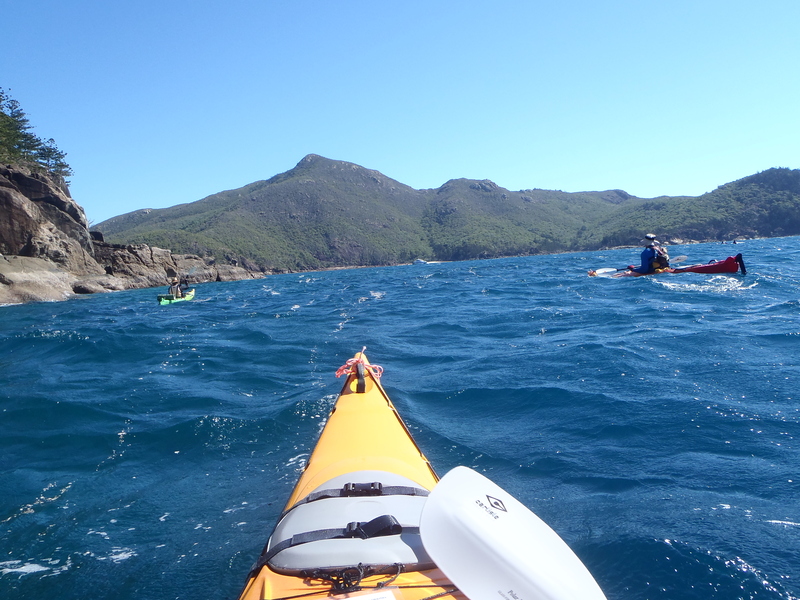 After emptying the kayaks we headed out to explore Naro inlet, the site of some aboriginal cave paintings. Monday 7th July Curlew Beach to Crayfish Bay, Hook Is. 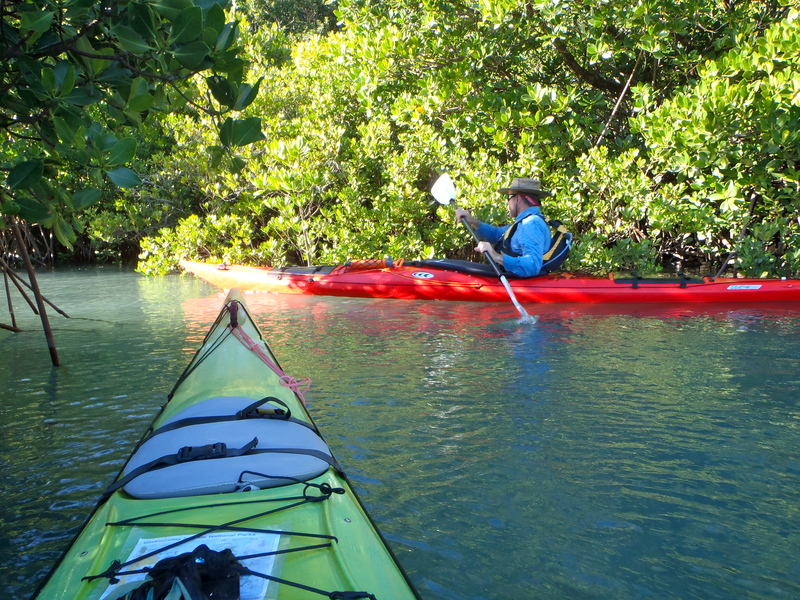 We paddle for just one hour to the beach adjacent the rear of the abandoned Hook Island Wilderness Lodge. We spent a fun hour exploring old buildings, finding huge lizards, trying to knock down green coconuts and eventually descending into the derelict depths of a disused underwater observatory, sadly the windows were mostly covered with algal growth. Upon return to our boats we discovered the tide had left us well and truly high and dry. A long drag followed! Not only had the tide changed, but the weather too, we spent the next two hours paddling with a strong tail wind and following 1.5m swell. Not all of us enjoyed the extra waves and chop but some enjoyed the messy waters by using them to catch some surf. We probably spread out a little too much in uncertain conditions today and agreed to be within a shout of one another in future in case some of the less experienced paddlers got in trouble. The 5 of us scrambled up the rocky face of the nearby cliff for some pretty spectacular views of the bay and surrounding headlands. Upon return from our walk we managed an afternoon of snorkeling and seeing some incredible coral. 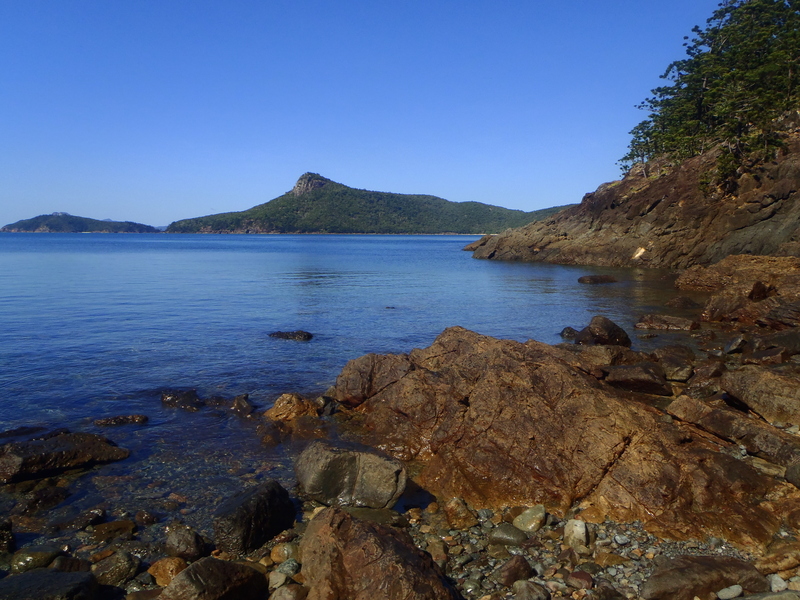 As the sun rested behind the peak, dinner was served, along with some fresh crayfish…it is Crayfish Bay! 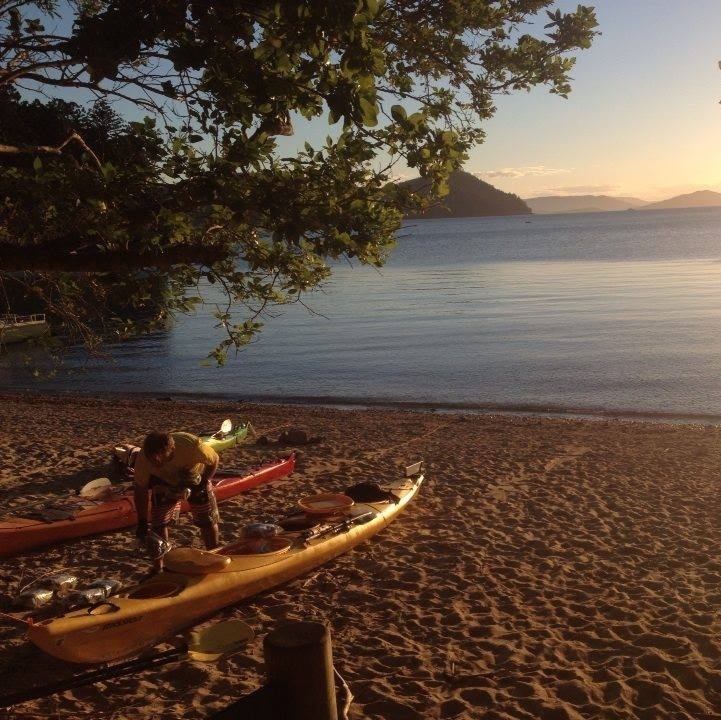 James was AWOL – there was a recently arrived French ‘beauty’, he headed out to ‘assist’ in securing her kayak! 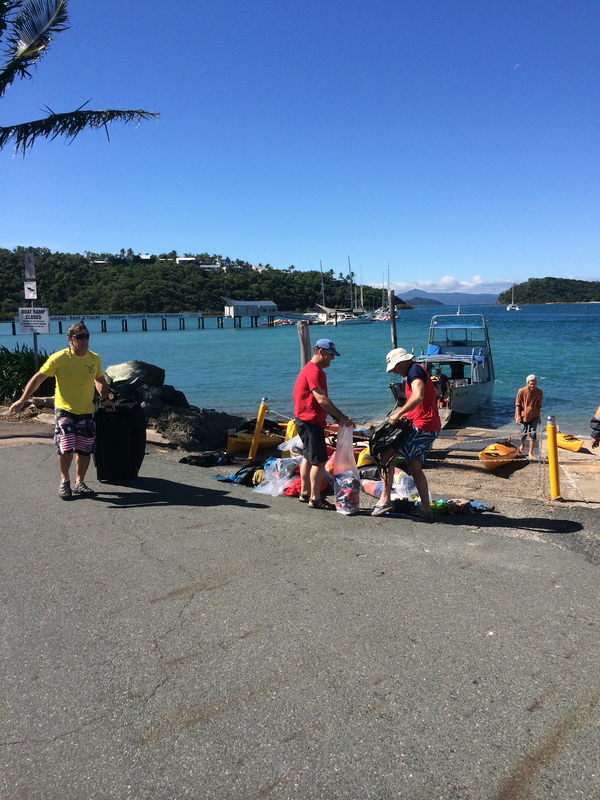 Tuesday 8th July – Crayfish Beach to Peter Bay, Whitsunday Is. Last night was a great night chatting with new friends. They took our rubbish, our empty jerry and served us crayfish…they were definitely feeling guilty about being at the wrong campsite! The big 10L bladders Salty Dog gave us did leak a bit but we were doing ok for water. The bigger worry was 2 broken rudder lines. 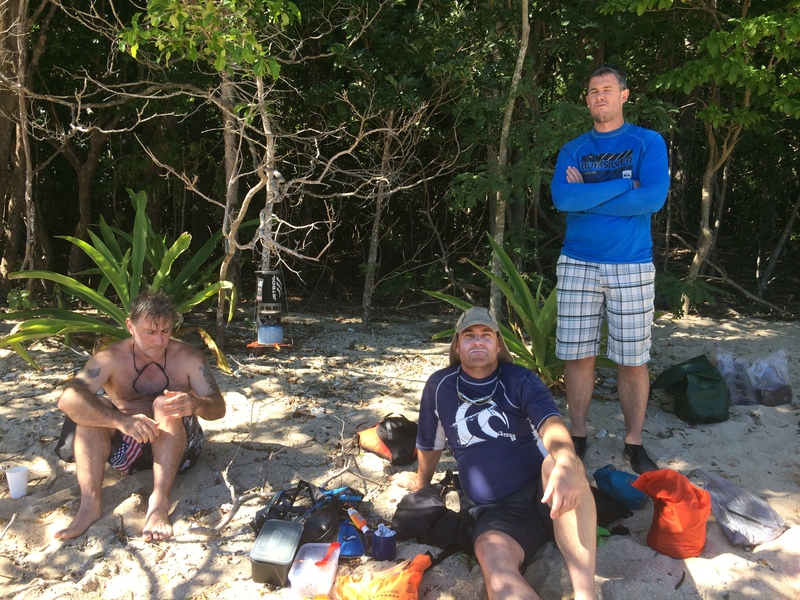 We took an hour fiddling with fishing line, then another hour at lunch but ended up ringing for help to Neil from Salty Dog who replaced the more damaged kayak the next morning. 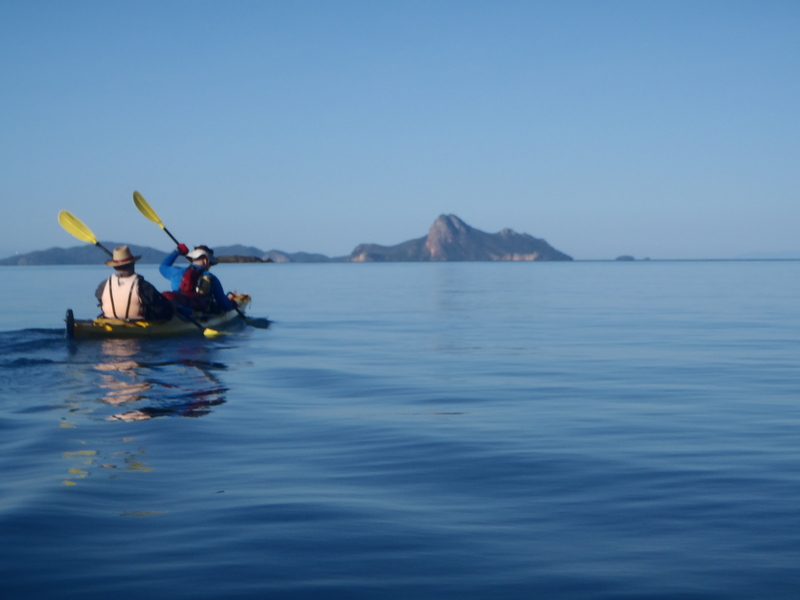 when a giant manta ray swam under my boat (‘Not that there’s anything wrong with that’ said Lance), this added to a daily dose of large sea turtles and other fish and dolphins it all made for entertaining paddling. 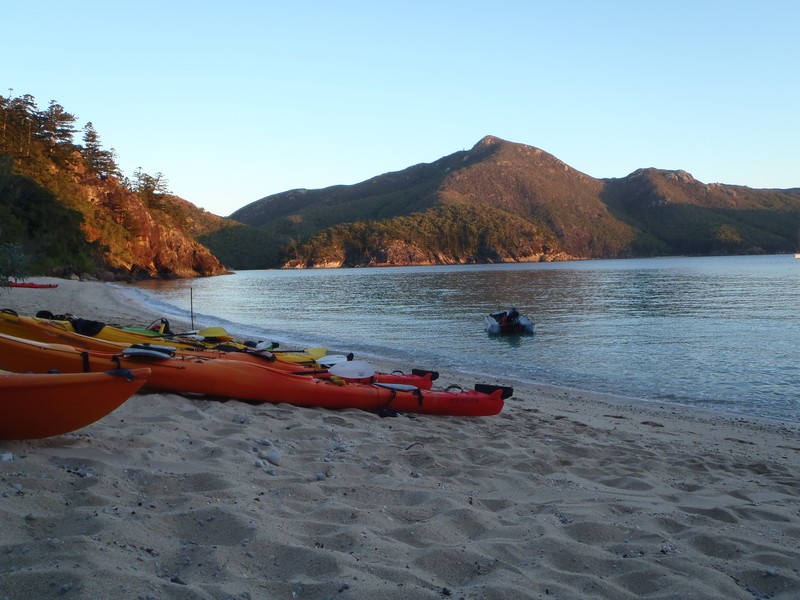 We paddled into the very long and shallow Peter Bay for our fourth night’s campsite. 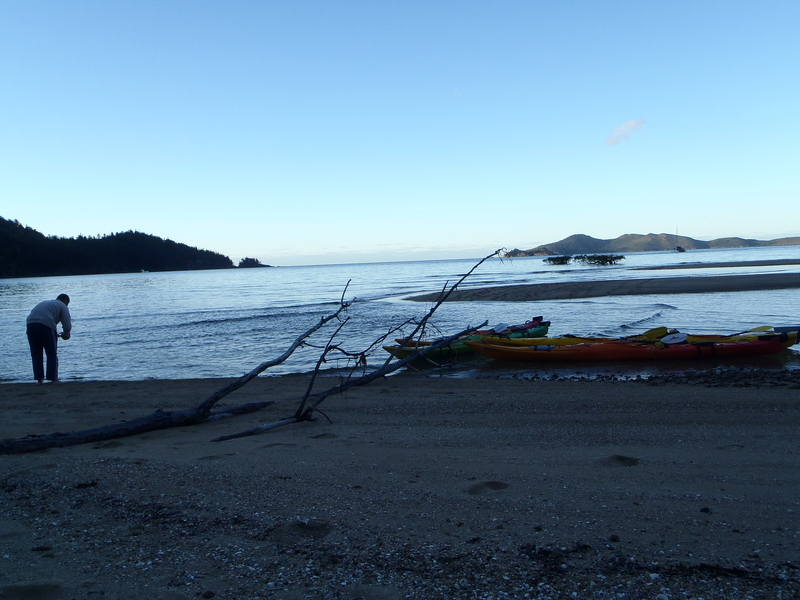 We had to stop paddling 400m from the campsite due to the low tide. The campsite was all our very own! It had a rustic feel to it after being destroyed by a cyclone in the last season, but we liked it a lot. It was here that my bowels finally kicked in and started moving! We could have had our own tropical island this camp felt so remote. The bird calls sang to us us we sat quietly on the beach absorbed by the evening atmosphere. 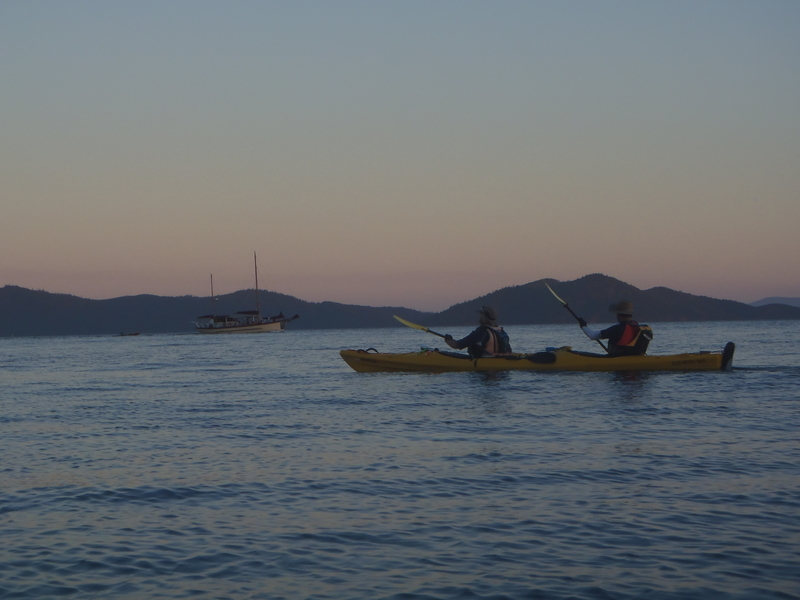 Wednesday 9th July – Peter Bay to Whitehaven Beach, Whitsunday Is. I had an average night’s sleep after waking to a scratching noise that turned out to be a rat sitting in my cup eating the remaining hot chocolate in the bottom! I had an amazing time of yoga/stretching and meditation on the little island in the middle of our part of the bay. Small 5cm waves rolled in past my feet. I invited James to join me and we experienced this sacred space for a few moments – mesmerizing! As we were about to head off when Neil from Salty Dog arrived with a new kayak for James. Neil and Hayley are such great people running a great business, he even brought out heaps more water for us. The water here today was like glass, so transparent, you could see 20 feet to the bottom! The coral was a blaze of colour and fish swam everywhere, again, turtles frequented our path every few hours. A large Mackerel put on a show right in front of our boats jumping many feet out of the water chasing flying fish. A pod of dolphins crossed nearby. At one point I entered a huge cavernous crack in the cliff face in my boat and sat in there listening to the swell rise and fall through the cracks in the rock, it sounded like the cliff was breathing! It would have been a blow-hole in bigger swell. 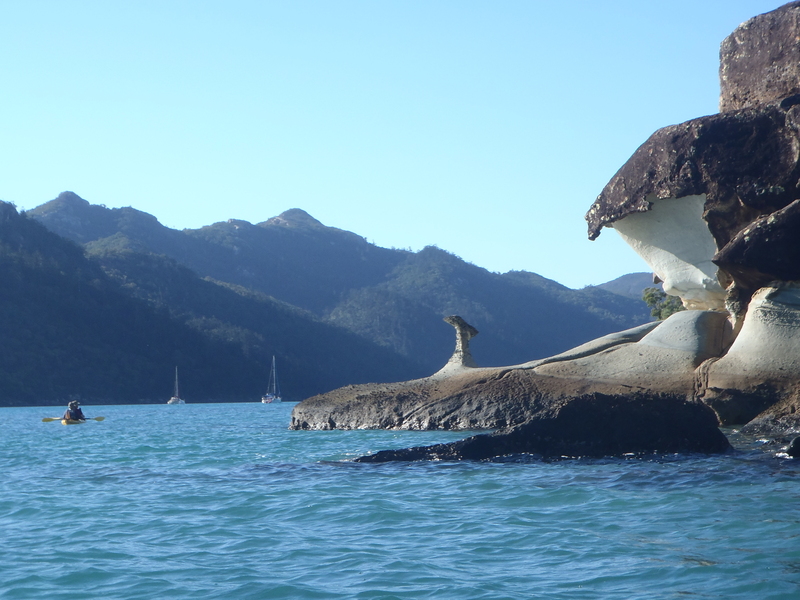 Another turtle swam beneath us and bays filled with sleepy yachts appeared as we moved along the balmy coast of Whitsunday Island, east side. 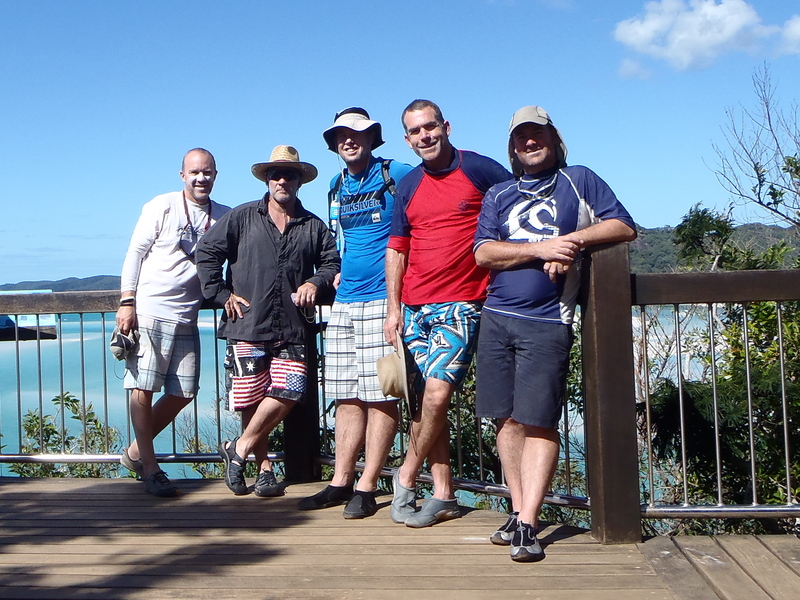 We stopped at the popular tourist spot in Tongue Bay, creatively named Lookout Beach. 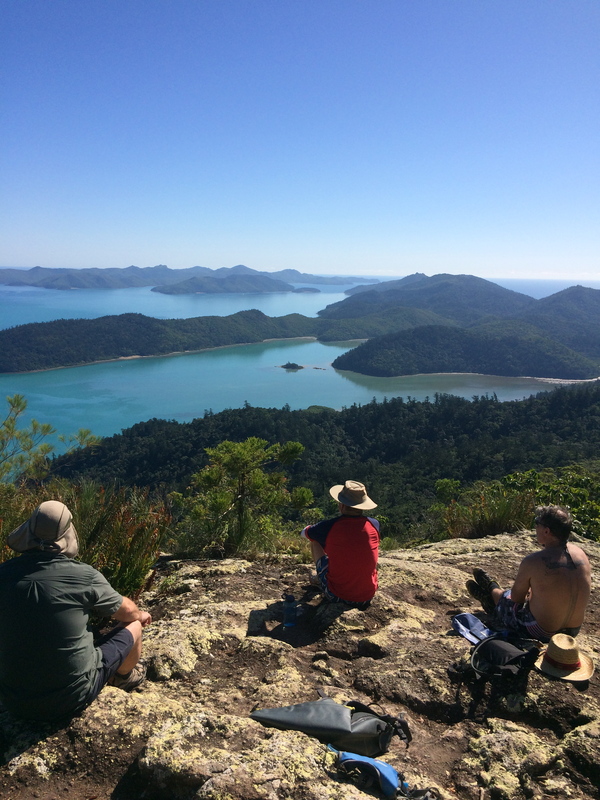 We waited until the throngs of people thinned and climbed the lookout for some memorable views down onto Whitehaven Beach and Hill Inlet. Sadly the promised Geocache hidden here never showed itself and my Travel Bug tag remained in my pocket for another search on another day and another island. 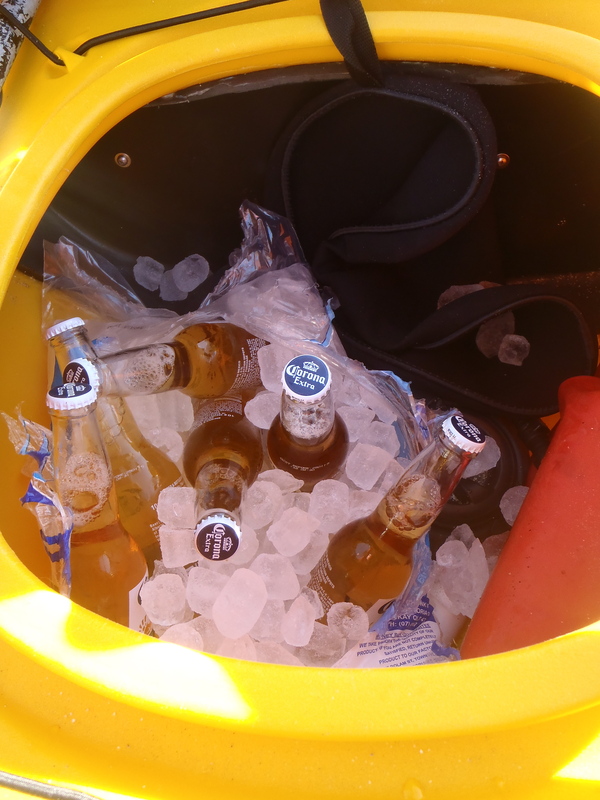 We returned to our kayaks and ate our now regular ‘second lunch’. 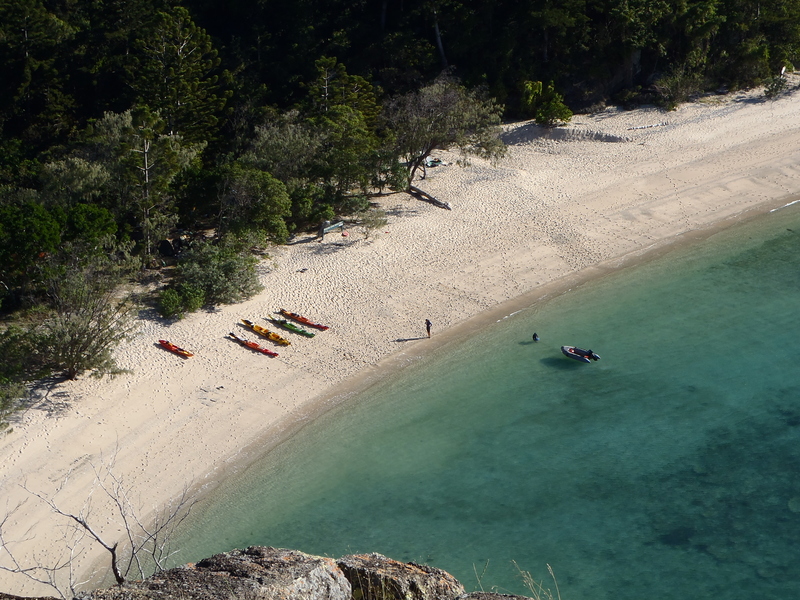 The 9km paddle to our Whitehaven Beach campsite at the far south end of the beach was nothing but surreal. We felt like we were floating on air the water was so crystal clear on pure white sand. 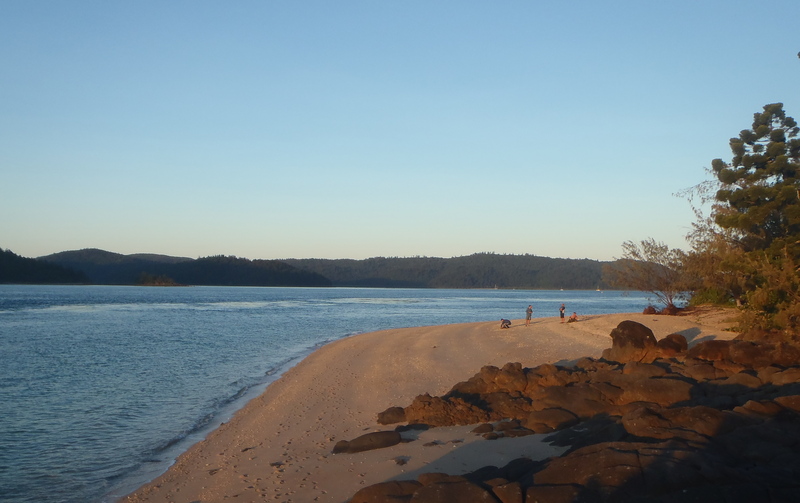 That afternoon we spent walking beaches or paddling to nearby Hazelwood Island and snorkeling amongst huge coral bombies and not so huge ref white tip sharks! 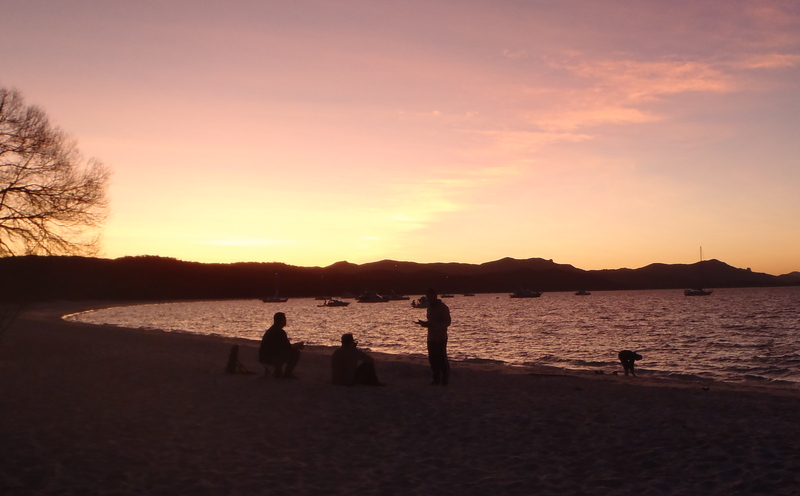 Dinner was eaten down on the squeaky white sand of Whitehaven Beach until the whole beach went pinky orange in the dusk glow, not a breath of wind was felt. 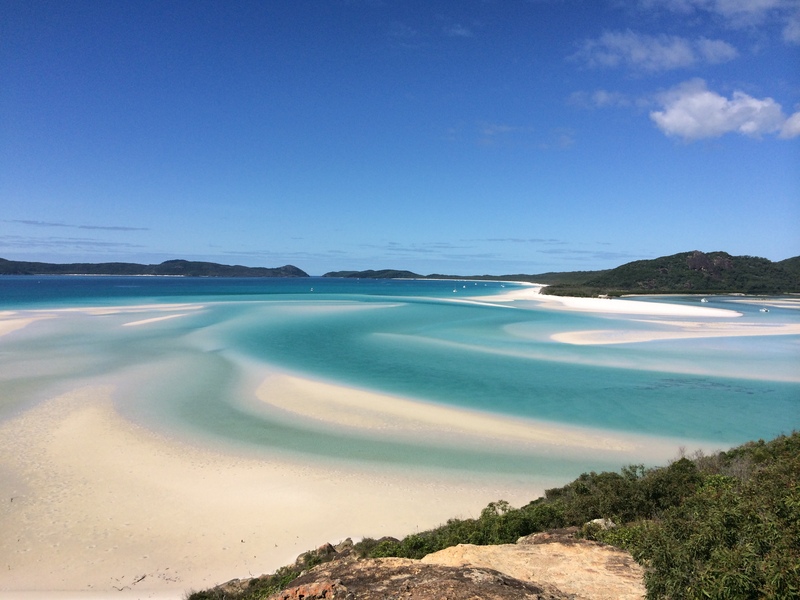 Thursday 10th July – Whitehaven Beach to Henning Is. 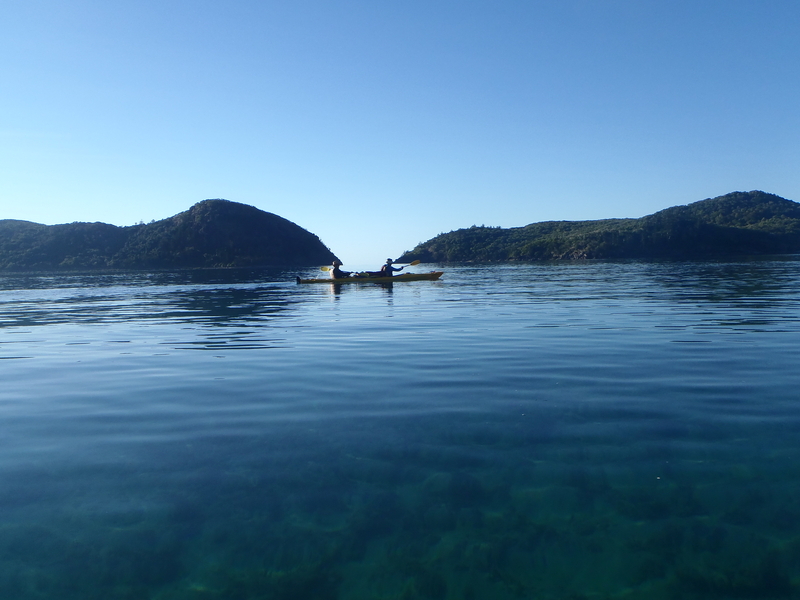 Again the morning paddle was like something from a text-book on kayaking – absolute perfection, a sea of light blue glass, towering cliffs, palm and coconut trees to the water and coral under our boats. 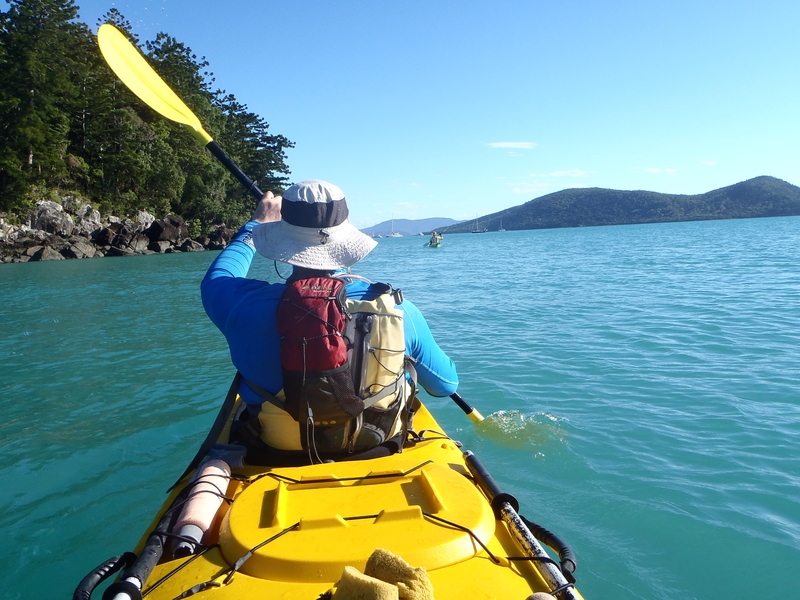 We met some headwinds and power paddled a good strong paddle into a small beach on Whitsunday Island in the channel between Hamilton and Whitsunday Islands. 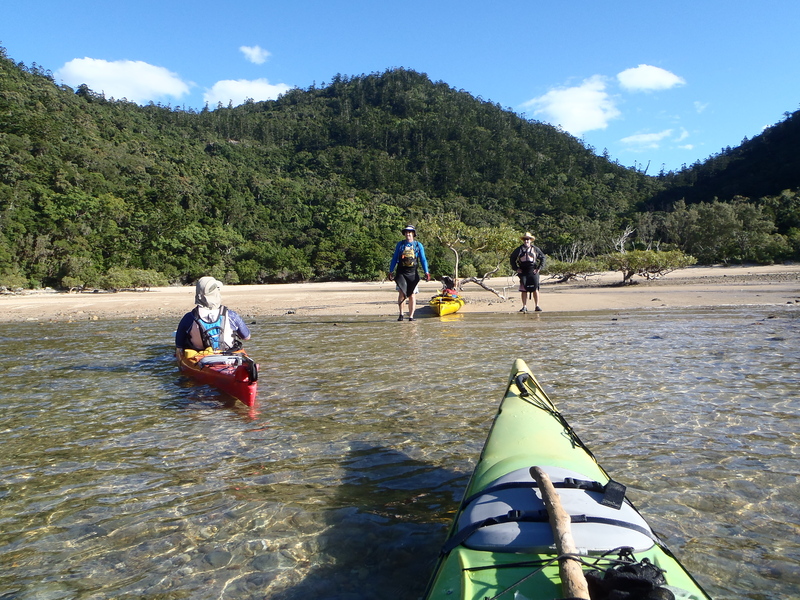 We ate our ‘first lunch’ here and headed straight on to Henning Island against a strong tide, some of us were ready to put down paddles and eat second lunch but some still had the paddle bug running through their veins. So a challenge was laid down, ‘can you (Scott) and Neale paddle the double to Hamilton, find a Geocache on top of One Tree Hill, buy us beers and ice and return in two hours?’ The challenge was on, James followed in the single. Well we did amazing time over and back but Neale and I were distracted by a) a massive hill climb and 2) a lost Geocache and James was distracted by…well lets just say, it was coffee…or the one who served it! So we added an hour to the challenge, but timed our return perfectly to see a Humpback Whale playing in the passage off our campsite. So as the sun turned yet another afternoon to evening gold we drank our Coronas and watched the whale do his (or her) thing! 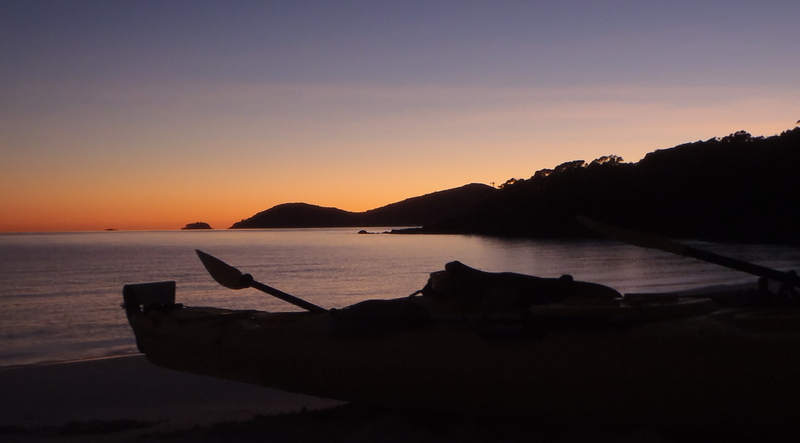 We had hit the 100km mark on our journey, a good hard 30km achieved today, so as the full moon rose over the islands we all crawled into our warm (except for Lances) sleeping bags and slept well despite the cool crisp air. 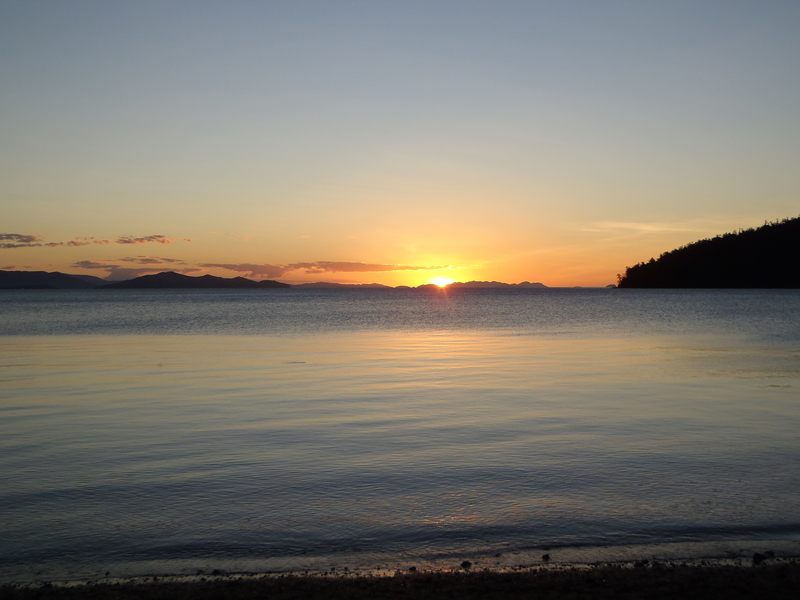 Friday 11th July – Henning Island to Nari’s Beach Whitsunday Is. Shouts could be heard as some chose to ride the sloppy swell, and as we pulled around the headland on Whitsunday Island it all disappeared back to its former glassy conditions, we headed straight for the shelter of Joe’s Beach then around one more tidal rush into Nari’s Beach, our taxi pick up point. 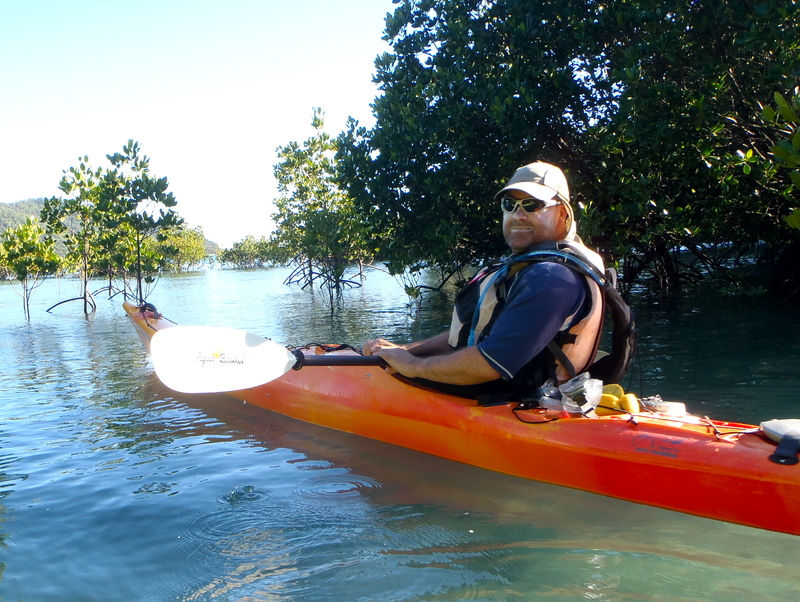 We explored a mangrove covered bay along the way and also added one last little ‘extra’ paddle around to the next bay where we had collected our food from Mike and Chrissy a week ago to make it a full circumnavigation of Whitsunday Island. 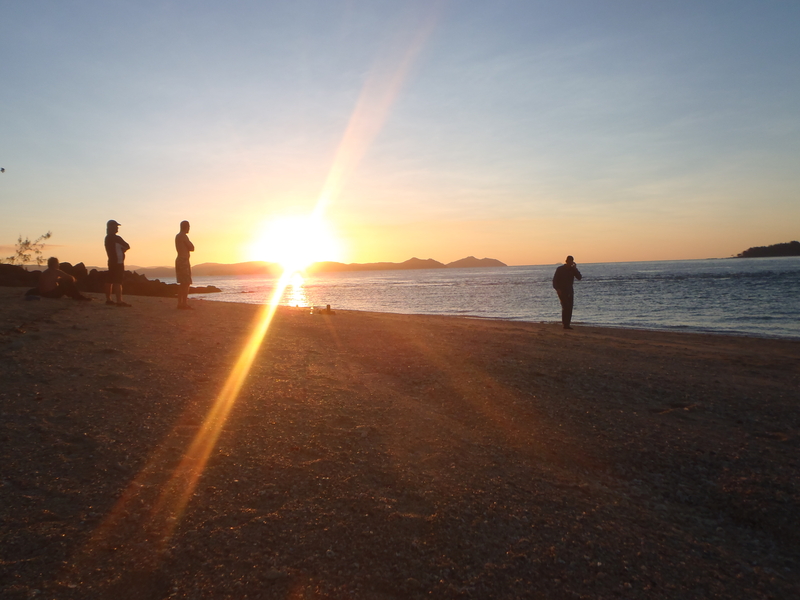 There we were back in Dugong Bay where our adventure had begun just 7 days ago. We breathed a sigh of relief when we hit the open sea in the water taxi, this 2.5m swell and wild wind could have eaten us for breakfast had we not decided to use the taxi! After unpacking the boats and repacking our bags, we thanked Neil and Hayley from Salty Dog very much for making our dream a reality. We caught the local bus into town and checked into the Beaches backpackers, had a few beers, a cheep meal with Mike and Chrissy and a good sleep. The next morning saw us jet setting off to our respective next destinations – Melbourne, Perth, Brisbane, Gold Coast and ultimately East Timor. A great weekend at Moore River with the whole family. After a long sand dune run!